⇒ HOW NUCLEAR POWER PLANTS WORK? HOW NUCLEAR POWER PLANTS WORK? The working principle of nuclear power plant depends upon mainly four components. Nuclear reactor is the main component of nuclear power plant and nuclear fuel is subjected to nuclear fission. Nuclear fission is a process where a heavy nucleus is spitted into two or more smaller nuclei. . A heavy isotope generally uranium-235(U-235) is used as a nuclear fuel in the nuclear reactor because it has the ability to control the chain reaction in the nuclear reactor. Nuclear fission is done by bombarding uranium nuclei with slow moving neutrons. The energy released by the fission of nuclei is called nuclear fission energy or nuclear energy. 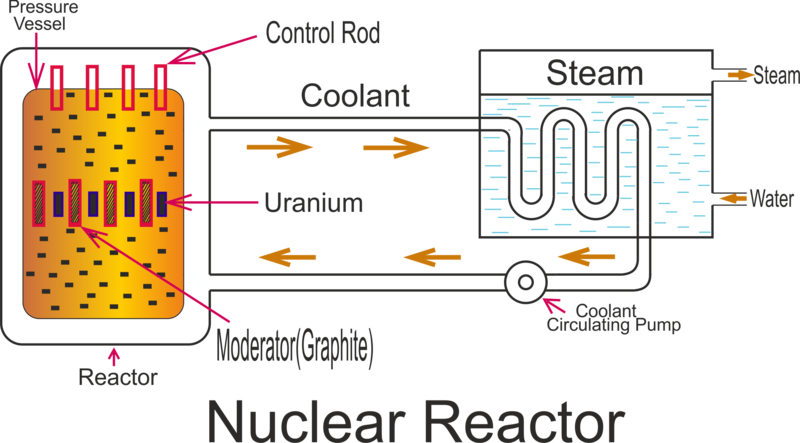 By the braking of uranium atom, tremendous amount of heat energy and radiation is formed in the reactor and the chain reaction is continuously running until it is controlled by a reactor control chain reaction. A large amount of fission neutrons are removed in this process, only small amount of fission uranium is used to generate the electrical power. The nuclear reactor is cylindrical type shape. Main body of reactor is enclosed by reactor core, reflector and thermal shielding. It prevent reactor wall from getting heated. It is also used to protect alpha ( α), bita (β) , gama (γ) rays and neutrons which are bounce back at the time of fission within the reactor. Mainly Nuclear reactor consists, some fuel rods of uranium, moderator and control rods. Fuel rods are made of the fission materials and released large number of energy at the time of bombarding with slow moving neutrons. Moderator consists full of graphite which is enclosed by the fuel rods. Moderator maintains the chain reaction by releasing the neutrons in a suitable manner before they mixed with the fissile materials. Control rods are made of boron-10 and cadmium or hafnium which is a highly neutron absorber and it is inserted into the nuclear reactor. When control rods are push down into the reactor core, it absorbs most of fission neutrons and power of the reactor is reduced. But when it is pulling out from the reactor, it releases the fission neutrons and power is increased. Real practice, this arrangement depends upon according to the requirement of load. 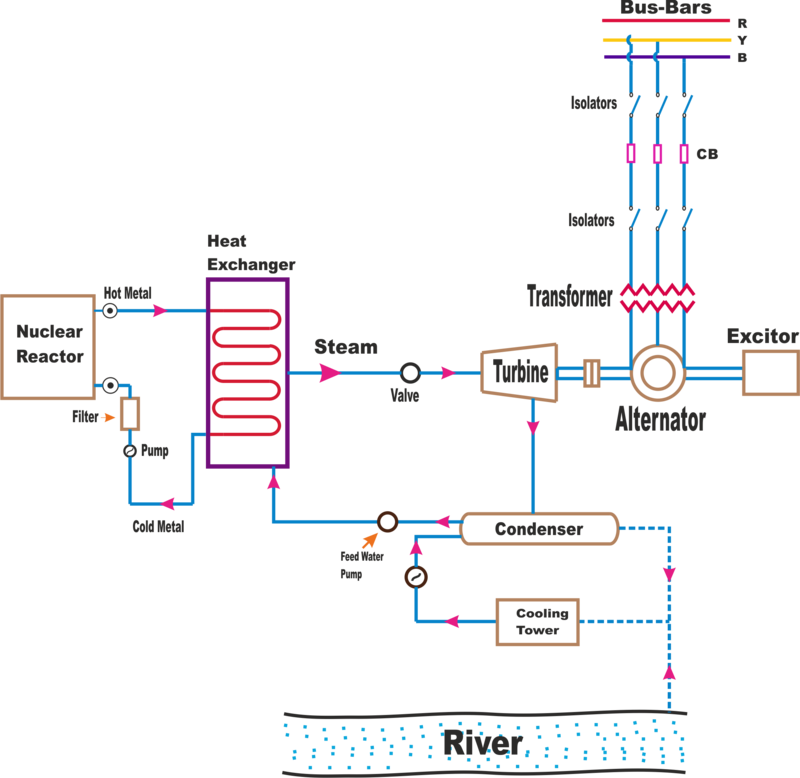 A coolant, basically sodium metal is used to reduce the heat produce in the reactor and it carries the heat to the heat exchanger. Coolant is used to raise the heat of the heat exchanger which is utilised in raising the steam. After that, it goes back to the reactor. Steam is coming from the heat exchanger to fed into the steam turbine through the valve. After that the steam is exhausted to the condenser. This condensed steam is fed to the heat exchanger through feed water pump. Steam turbine is coupled to an alternator which converts mechanical energy to electrical energy. The output of alternator produces electrical energy to bus bars via major electrical apparatus like transformer, circuit breakers, isolators etc.